Tilos Trails have left the beautiful and secluded Dodecanese island of Tilos but please use any information on the site, although some is outdated, it will soon be gone. Most Greek Islands will be described by those who live on them as ‘beautiful’ and in nearly all cases this holds true. However, each Greek island has its own individual character due mostly to the fact that in times gone by, indigenous island populations tended to stay put and, with the exception of fishermen and sailors, rarely visited other neighbouring islands. Our aim is to pass on some of the knowledge that we have acquired over the years, (and we get a lot of fun doing this!) while we walk the paths and trails, so that you too can begin to understand the unique nature of Tilos. 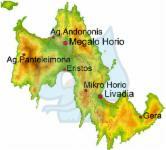 Tilos is small, some 64 sq. kms. and has two main villages, Megalo Horio at the northern end and the more ‘modern’ Livadia, where most of the accommodation can be found, at the southern end. Also, tucked into the hills above Livadia, lies the village of Micro Horio, abandoned in the ‘60’s in favour of an easier existence in Livadia. Unlike the neighbouring islands of Simi and Halki there are many small settlements and small holdings scattered around the island and a multitude of old stone tracks were constructed to link these settlements and agricultural areas. The reason for this large infrastructure of buildings all over the island is quite simple. Tilos is blessed with a large number of clear natural springs which allowed the permanent establishment of small communities in the areas around these water sources. Generally quite rugged, and on first sight appearing bare and barren, it will soon become apparent that this dramatic landscape is less hostile and more fertile than expected. Tiliaki (people from Tilos) had no need to engage in dangerous occupations such as sponge diving or fishing to earn a living as they could support themselves in grand fashion from the land, all their needs coming from industrious and diverse farming which produced large quantities of cereals, chick peas, almonds, olives, citrus fruits, grapes, vegetables and livestock such as goats, sheep, pigs, cattle and poultry. Evidence of all this endeavour is the terracing that covers almost all of the slopes on the island, and the round stone grain threshing circles that ‘crop’ up (excuse the pun!) in the most unlikely places including the inhospitable ridge of the island’s highest mountain, Profitas Ilias, at around 650 meters. Farming went into steep decline during WW II as the German Army imposed strict curfews on people going to their land or tending their animals. When the Germans eventually left Tilos and the people could return to their land they discovered that most of the live stock had been slaughtered and eaten including the oxen used to pull the ploughs. The post war years were very hard and for many the final straw was the beginning of military rule following a coup by 5 Generals of the Greek army in 1967 (The ‘Junta’) forcing many to emigrate, to the USA mostly, but also Australia and, ironically enough, Germany. However, as result of all this industry Tilos was left with a legacy of old stone paths and routes that will keep even the keenest walkers busy for their entire holiday. Over the years we set out to discover as many of these old paths as possible and, sometimes with the help of the local shepherds, or just searching around for ourselves, we have pieced together a wealth of knowledge on the routes of these old trails many of which are not commonly known or published. We look forward to you joining us on one of our walks and make our day by letting us make yours.